There can’t be many people of a certain age who don’t remember the tins of fruit salad - if you were unlucky, accompanied by evaporated milk - that were regularly served up as dessert. Fact is, these culinary compilations retain to this day a presence on supermarket shelves, not least because they deliver a healthy shot of vitamin C without the waste associated with unused items of the fresh variety that some latter-day kids seem less enamoured of. There is also the convenience angle, which no parent trying to juggle the demands of work and child care would ever underestimate. But when the kids are tucked away for the night, and there is a question mark hanging over what to serve up as a starter, then taking the Italian route, and ensuring along the way that none of the items in the fresh fruit bowl go to waste, makes for a fascinating and tasty alternative. And with spring soon to turn into summer, the abundance of choice means cooks have top-quality raw materials to hand. Let’s begin with peaches, preferably examples whose flesh is on the cusp of ripeness to ensure a little firmness in terms of texture. The key here, as in all fruit salads, is a balance between sweet and sour. So the big question is, what to pair the peaches with in terms of joint billing in the dish. Well, think about sweet, cherry tomatoes, mixed leaves of your choice, and a good bunch of basil, the whole brought together by a vinaigrette of oil and balsamic vinegar. You can use this recipe as a base upon which to build further layers of flavour, so, for example the dish could be beefed up, if you forgive the pun, with torn slices of bresaola; alternatively, a pork-based cured meat such as Parma ham or speck would work equally well. White-meat aficionados can plump for pieces of freshly grilled chicken or turkey. If apples are predominant in your fruit bowl, then again pick the firmer fleshed examples. If you are prepping ahead of time rather than slicing at the last minute, you will need to prevent the apple pieces from turning brown, which can be achieved by either blanching for 30 seconds in boiling water, or anointing them with some freshly squeezed lemon juice. So what to balance the sweetness and crunch of the apples? An obvious combination is walnuts and gorgonzola, with mixed leaves providing a colourful and complementary base and a vinaigrette of lemon juice and oil the finishing touch. Given the age-old relationship between pork and apples, some torn pieces of prosciutto crudo or cotto will be warmly welcomed by the carnivores amongst the gathered diners. Another combination using apples and pork – this time pancetta - involves a marriage with leaves, thinly sliced champignon (button mushrooms) and a lemon-based vinaigrette. The pancetta should be crisped in a pan along with the mushrooms. Allow the contents of the pan to cool before adding to the leaves, otherwise the latter will wilt in the company of the hot ingredients. The more observant may be wondering why that old stand-by, melon and Parma ham, hasn’t made an appearance. The answer is not because of inverted snobbery born of predictability but because an even tastier way to make use of a melon is with pre-cooked shrimp, rocket and string beans, the vinaigrette being lemon-based. 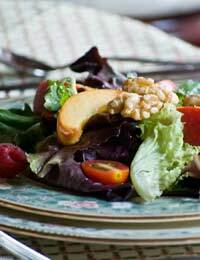 The secret to a great salad, barring the quality of the ingredients, is to only dress your salad at the last minute, otherwise the acid in the vinaigrette will begin eating into the leaves, and their bite and integrity will be compromised. In terms of tossing, it is advisable to forget those rather cumbersome salad utensils a relative lost for ideas shoved into your Christmas stocking, and rely on your own natural tools – your fingers. Lightly toss the ingredients to adorn them with the dressing and to ensure an even mix – it may look pretty to balance a single component such as meat or fish on the top, à la fine dining, but the reality is that a salad should be the sum of its parts, each ingredient playing an equal role in ensuring the success of the finished dish. If you are feeling indulgent, let the children dig in to what the grown-ups are enjoying – remember food education in Italy starts almost immediately. Once their palates have been alerted to real fruit salad, the tinned variety is likely to be left on the shelf.